During the nineteenth century, many members of the Warder family of Shanklin, Isle of Wight engaged in the trade of shoemaking (although they often listed their occupation as cordwainer -- an older term for shoemaker). By the middle of the century they had shoe shops scattered in several different towns at the eastern end of the Island. At the top of the Chine stands the village with its old cottages, its ancient yews, vigorous elms and cedars, and a gabled and thatched inn with little bow windows. The town is rich in public gardens where we may sit and watch the ships pass up and down the Channel or listen to the community singing when the gardens are aglow with fairy-lights. Two poets who loved to stay at Shanklin were John Keats and Henry Wadswoth Longfellow and they did some of their writing there, as did Charles Darwin. Keats lived at Shanklin around 1820, while Longfellow and Darwin came to Shanklin many years later. 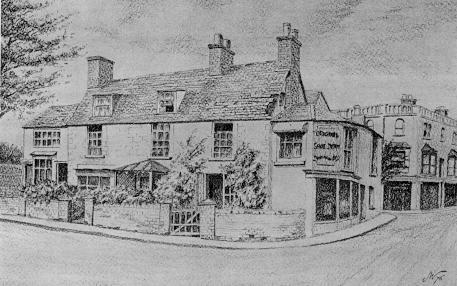 On November 30, 1759, Robert married Elizabeth Cawse at Brading. Isle of Wight vital records show only two children for this couple -- a son Robert who died in infancy and was buried at Brading on January 28, 1762 and a daughter Frances baptized June 5, 1763 at Shanklin. Elizabeth Cawse Whitebread died at age 54 and was buried at Brading on 11 April 1781. Her daughter Frances was 17 at the time. Just over two years before this, on February 5, 1779, Robert Whitebread took two apprentices into his shop - Stephen Prichard and Robert Warder. (Note 3) The latter was the son of William and Mary (Jacobs) Warder of Bachelor's Farm, which is just a mile or so west of Shanklin. He had been baptized at Newchurch on December 23, 1763. Eventually apprentice Robert Warder began courting his master's daughter and he and Frances married on November 24, 1785 at Shanklin. Upon finishing his apprenticeship Robert Warder then joined the Whitebread shoe business as a partner to his father-in-law. Robert and Frances may have lived initially with her father over the shoe shop, but records show that on August 1, 1791, they rented a newly-built cottage at Shanklin. (Note 4) Robert and Frances had three daughters by this time and their family eventually grew to eight children -- four boys and four girls. By 1800, Robert Whitebread had reached the age of 66, so his son-in-law took over more and more of the work of shoe business. Eventually the four grandsons -- William, Robert, John, and James Warder -- began assisting in the shop. Although the shoe business at Shanklin began before the involvement of any Warders, over the years the shop and house became known as the Warder block and the corner on which it was located was called Warder's Corner. Each of the Warder boys apprenticed to their father and learned the shoe business. William, the oldest, eventually left home to become a shoemaker at the nearby town of Brading. Undoubtedly Robert Warder helped his son to establish his own shop. As the next two boys reached adulthood, Robert helped each of them establish their own shoe shop in a neighboring village. Robert Warder, Jr., opened his shop at Wroxall and John Warder went into business at Nettlestone. James Warder was still at home when their father died in 1829 and he took over the shop at Shanklin. There is evidence in directories from the 1840s of a Warder boot and shoe shop in Yarmouth owned by a William Warder, but whether this was the same William, his son (also named William), or a Warder from a different family is yet to be determined. For many years after that time, the Warder family remained a major force in the production and sale of shoes and boots on the Isle of Wight. Although the Shanklin shop was torn down in 1875, the family continued the business in the new building constructed on that site. James Warder operated the Shanklin shop until he retired and turned it over to his son William. William eventually passed it on to his children. In 1926, they sold it to a distant cousin Victor Harvey (his great grandfather was the William Warder who established the Brading shop) from Andover, Hampshire. He operated the Warder-Harvey stores on the Island for many years, eventually selling out to a large chain of shoe stores. 1. Mee, Arthur. The King's England, Hampshire with the Isle of Wight (1967), pp. 326-327. Return to the text. 2. All dates of baptism, marriage, and burial in this history are from church records on file at the Isle of Wight Records Office at Newport. A card index to these records is available on microfilm through LDS Family History Centers under the title Isle of Wight Consolidated Parish Records Index. Return to the text. 3. A record showing these apprenticeships appears in "UK, Register of Duties Paid for Apprentices' Indentures, 1710-1811" on the website Ancestry.com.Return to the text. 4. Miscellaneous records portion of the Warder records in the Isle of Wight Consolidated Parish Register Index. Return to the text. 5. Will number 1821B/83, Hampshire Records Office, Winchester, Hants. Return to the text. 6. Parker, Alan. The Story of Victorian Shanklin. Return to the text. 7. Will number 1829B/112, Hampshire Records Office, Winchester, Hants. ; lease information is from the miscellaneous records portion of the Warder records in the Isle of Wight Consolidated Parish Register Index. Return to the text.